Use your LEGOLAND® Florida Resort 2-Day Ticket to blast your way through the Lost Kingdom Adventure, design your own LEGO car, hone your firefighting skills at the Fun Town Fire Academy and experience the action of Pirates Cove and much more! Great LEGO Race - combining roller coaster thrills with virtual reality the Great LEGO Race pits guests against a pirate, wizard, surfer and pharaoh as they steer LEGO-built vehicles in the center of an action-packed road rally where the laws of physics and aerodynamics only loosely apply! LEGO® NINJAGO® - The Ride Blast animated fireballs, lightning and more at a sinister gallery of villains before teaming up to defeat a powerful foe. Track your score against friends, family and other guests, then ride again! LEGO® MOVIE™ 4D A New Adventure - Join your favourite LEGO® MOVIE™ characters in an exciting new plot. With some of the original voices from the film mixed with 4D effects, you can look forward to an awesome adventure.Driving School - This is one of the favourites at LEGOLAND Florida and should not be missed. Fun Town Fire Academy – Families demonstrate their firefighting skills by competing against other families to rescue Fun Town from a “fire”. The Dragon – An indoor/outdoor steel roller coaster that features a spirited and humorous view of life behind the scenes within the enchanted LEGOLAND Castle. LEGO World of Chima - presented by Cartoon Network, features an immersive family experience with an interactive water ride, The Quest for CHI, a super-charged Speedorz™ Arena, Cragger’s Swamp water play area, a new 4D movie experience and character meet-n-greet sessions. LEGO® STAR WARS™ Miniland - enjoy seven of the most famous scenes from the six live-action Star Wars movies, as well as a scene from the animated series Star Wars: The Clone Wars™ all made out of 1.5 million LEGO® bricks built in 1:20 scale. Guests will be further immersed into the Star Wars experience as they pose with life-size LEGO models of Chewbacca, R2-D2 and Darth Vader. Admission to the LEGOLAND® Florida Water Park is not included with this ticket. You will be sent an official gate-ready ticket for LEGOLAND® Florida Resort. This ticket gives you instant access to the park. Tickets are open-dated ticket that can be redeemed at any time on your holiday when the park is open. Park opening dates and times are subject to change without notice. Please check park opening hours before you visit the park. Where is LEGOLAND® Florida Resort Located? LEGOLAND® Florida Resort is situated in Winter Haven, a simple 30-40 minute drive south of the Orlando theme parks. 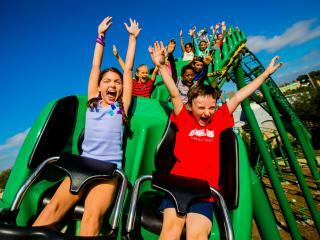 Does my LEGOLAND® Florida Resort Ticket include transportation to the park? Yes, we are currently running a FREE ROUNDRTIP TRANSPORTATION Special Offer with LEGOLAND® Florida Resort Ticket purchases. The LEGOLAND® Florida Resort Shuttle Bus runs from I-Drive 360, 8401 International Drive, Orlando, Florida 32819. The shuttle pick up is outside the car park near the back entrance of the Orlando Eye on the Universal Boulevard side of the property. Transfers must be booked by 11.30am the day before you visit the park. Customers must ring the number on the LEGOLAND® Florida Resort transportation voucher to reserve their seats.